The perfect room for a romantic escape, bedroom 2 has a large Four-Poster bed and a modern en-suite shower and toilet. This room has a large window and lets in plenty of light all day long, especially in the mornings. Delightful Edwardian family run B&B close to open forest. Spacious, comfortable en-suite rooms with four poster beds. Walking distance from village center. Private parking and garden. Little Hayes sometimes limits bookings to 3 or more days. tea & coffee making facilities (with a selection of fair trade teas, coffees and hot chocolate),complimentary biscuits,hair dryer,complimentary toiletries (Shower Gel, Shampoo, Body Lotion, Shower Cap and Soap). 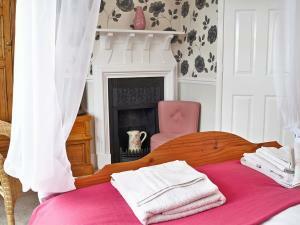 Room 1 is priced at £88 per night based on two people sharing, and includes breakfast. All of our guest have the use of a Brand New Forest card, which gives access to a variety of special offers and discounts from local businesses throughout the New Forest. 1 Four Poster sometimes limits bookings to 3 or more days. Bright, spacious and Ideal for couples or friends, bedroom 3 has two single beds that can also join together to form a comfortable super king size double bed, and includes a modern en-suite shower and toilet. This spacious room lets in plenty of light all day long, especially in the mornings and also overlooks our garden, including our large fish pond and fountain. complimentary toiletries (Shower Gel, Shampoo, Body Lotion, Shower Cap and Soap). 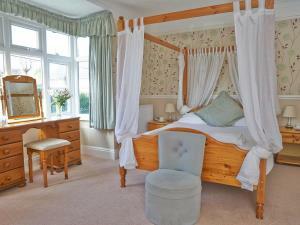 Room 3 is priced at £88.00 per night based on two people sharing, and includes breakfast. All of our guest have the use of a Brand New Forest card, which gives access to a variety of special offers and discounts from local businesses throughout the New Forest. 3 Twin/Double sometimes limits bookings to 3 or more days. The perfect room for a romantic escape, Room 5 is a second floor room overlooking the garden and pond, with double bed and spacious, modern en-suite shower room (with double sink), and a delightful sitting area. Height restricted in places. 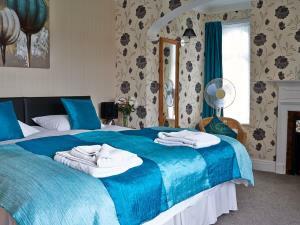 Room 5 is priced at £88.00 per night based on two people sharing, and includes breakfast. All of our guest have the use of a Brand New Forest card, which gives access to a variety of special offers and discounts from local businesses throughout the New Forest. 5 double sometimes limits bookings to 3 or more days.